When I am only minutes into a viewing of a film, series or documentary and I feel I can relate and start to get a grand sense of how good a person is just by a few moments look into their lives, I know that I am in for a great and inspiring ride and this was certainly the case with Off the Boulevard. This documentary explains how life is for most good people in the film industry and easily as equally describes how I’ve felt on my one year in. It provided a look into the lives of artists I’ve already respected and artists who in just the past few hours have come to respect upon first indication of them. I couldn’t look away from the screen as I viewed this great, intelligent and realistic view at the lifestyles of the film, music and comedic industry and how difficult it can be for those we look up to. Artists that struggle to survive, but strive to entertain folks all around. True commitment from the hearts of greats artists who cherish, respect and appreciate what they do and how they do it. This documentary is a shocker and a awe-inspiring attention-grabber that sits you down and tells you how it is. At the same time they tell you that how it is, is an okay way of life. They show you how wonderful it can be even when you are struggling, even if you aren’t notable. It shows you how honorable it is to be one thing…independent. The music in the documentary was well placed and filled the mood. At time of sadness within this inside look, music was placed that equally matched the tone and filled your heart with a glimpse of the sorrow felt from the persons involved, the hardships they faced and the kindness they provide. The music, put together so splendidly, was an honorable and enriching part of the experience of the viewing. With a few more notable figures as well as those other independent faces fans love and adore, every interview was filled with intrigue and thoughtful insight into the selective persons industry. Humor was also invoked and a few various pranks within the lives of these cherished performers were shared with the viewer and left me filled with laughter and joy and wishing I could have a group of friends who shared similar interests in life. Every moment strung together vividly and with seamless wonder. Not a thrown together piece nor an uncared for project. This is clearly someone’s baby. A project that took time and grand effort to put together and features many pulling insights to how the entertainment industry is. Every different piece cut together greatly. Switching through the various persons and careers, the documentary introduced me to a number of great people and by the end, I felt like I made new friends. Off the Boulevard is a grand documentary put together by director Jeff Santo that tells you how it is. It features so many great performers and entertainers that listing them would pull upon far too much time and thus it is much simpler and better-fitting to collectively label them as entertaining and insightful. It is better to not list them than to forget one of these gripping and encouraging looks into their lives. This documentary made me feel a spark of which I have had and have been looking for more of, a good group of folks who can truly appreciate what independence within the entertainment industry is and use it in the best interest of the craft and of the people who enjoy the craft. This is a real world-shaker and a heart-clincher of a documentary. A viewing of this for any youthful entertainment insider can help guide their paths and provide the valid information of which they all require, how to be human, independent and in love with the art. Off The Boulevard is a story of art and heart and the dedication it takes to achieve your dreams. 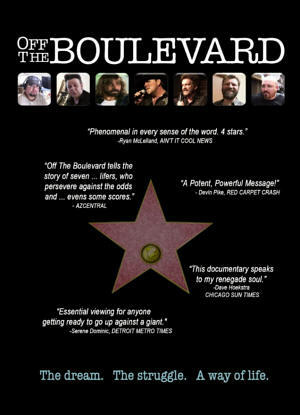 It is an entertaining and informative documentary feature film about seven artists: two musicians (Nick Nicholson, Keith Jackson), two filmmakers (Troy & Jeff), two actors (David Della Rocco, Sanel Budimlic), and one comedian (Bob Rubin), whose friendships are created through struggle and perseverance. The film features industry insights from well-knowns such as: Peter Fonda (Easy Rider), Joe Mantegna (Criminal Minds), Gilby Clarke (Guns N’ Roses), Sonny Barger (Hell’s Angels), Dan Haggerty (Grizzly Adams), and Eddie Vedder (Pearl Jam). Comments for “Off the Boulevard” – Exclusive Review are now closed.